Ever since I started playing again I have been experiencing crashes (You can tell the difference between an experienced sims player and a newbie by the kind of effect having a game crash causes on them. lol. Seriously, I’m like “it’s all good”) Anyway, the main reason why I have been having crashes is because of the world I’m playing. Yep. I learned routing problems can cause a crash and there is nothing you can do about it other than prevent routing problems. How? Well, I wasn’t using the Debugenabler and Errortrap mods from nRaas on this particular save and once I put them in the game the crashes stopped happening from a 70% chance to a 5% chance. So that’s one way to stop your routing crashes. — Now, this post on crashes is not to report on routing crashes but I have deviated from the main subject as I always do. Sorry ’bout that. What’s hilarious (and kinda scary) is that the person with the crashing problem on this site is no other than me. Yep. Your one and only. True story: if you every see a screen name with JADEEYES anywhere or just JADEEYES, well that would be me… 99% of the time. Now, after reading my poor attempt at trying to ask for help and solving the problem I tried playing the game once more, suspecting I had corrupted the ‘save’ file – because let’s face it, if breakpoint meant I have a corrupted installation the game would have been crashing long time ago with this particular problem, like right after doing my reinstall sometime in 2014, so it’s safe to assume that whatever is corrupted happened right before I clicked that beautiful blue arrow symbol on my launcher, and that it is most likely (100% positive) caused by me. It crashed again. Fearing losing all my progress on this generation 2 of Randominovs, I was already about to cry (yeah, wasn’t feeling like an expert then) when I thought of doing something which I have to say I feel so proud because I would’ve never thought of that before. Am I getting smarter? BAH. Okay, so I right-clicked on the folder The Sims 3 and clicked on ‘restore previous version’, it showed me two late versions of this game from last week; I picked the closest to the present version being one day ago and went with that. The game ran perfect, no crashes. Problem solved. Sure I lost an entire day of gaming (which I had accomplished a lot) But hey! That’s better than losing the entire generation. And now I’m going to sleep because I have spent my gaming time fixing this crash which I provoked myself by deleting the ‘backup’ folder of the save. Yeah I do that… dumb. How is everyone doing this weekend? I come to show you something I’m working on that will most likely be up for download some time this month. 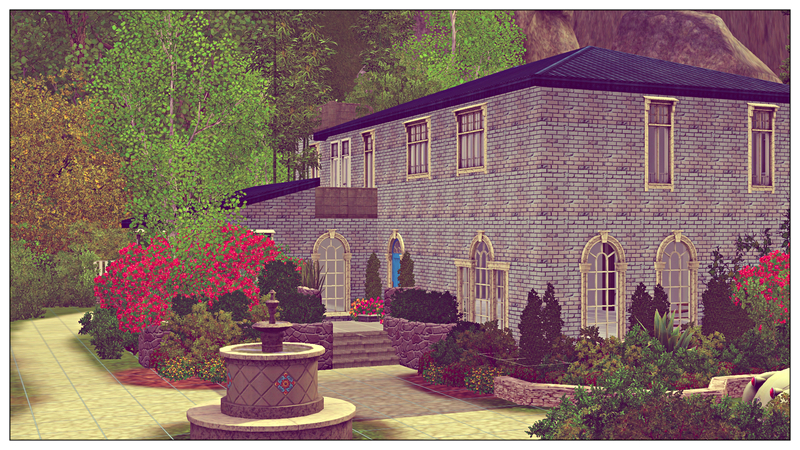 It is a house I will feature in the next chapter of The Mellarks which will be posted next week. I told you guys I was inspired! Haha. 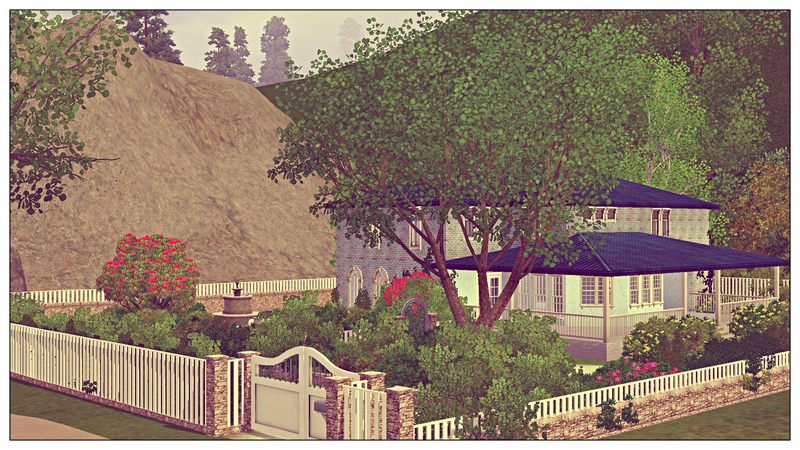 I lost the two houses I was using for The Mellarks of Sunset Valley (Annabelle’s house and her grandmother’s) I could have used a house from my favorite creator (rubyred) but as much as I love her lots I wanted to create one myself. It just doesn’t feel right somehow. 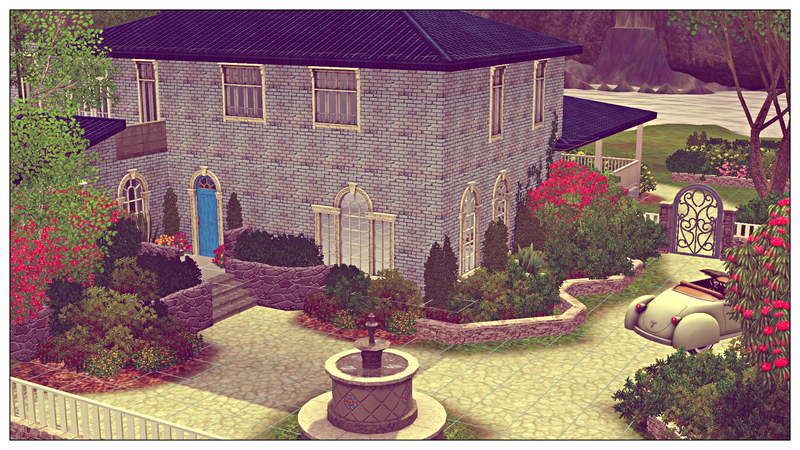 So this house happened. Thank you for stopping by and reading my craziness. I appreciate all the comments and support. All content for download created by me is free and owned by EA. If you upload in any other site please give credit to the artist by linking back to this blog or particular post. Do not claim as your own please. There is no telling where the path may end, as long as where it ends, it tells the true story. If you follow me, don't blame me for the thorns in your heart.